We believe every child is born with incredible potential, and we are committed to continuously evaluating and improving our programs to ensure our Bigs are equipped to defend that potential. One-to-one matches between Bigs and Littles truly empower youth and strengthen communities. Professional staff from Big Brothers Big Sisters carefully build and support each match, and ensure it meets the strictest standards. Agencies strive for matches that are not only safe and well suited to each child’s needs, but also harmonious and built to last. The entire matching process, from the initial screening to the final pairing—and beyond—is made possible by your financial support. Big Brothers Big Sisters is the country’s largest evidence-based mentoring organization. We are committed to continuously evaluating and improving the quality of the services we provide to youth. We evaluate our programming at the match level, agency level, and national level. Our annual impact report provides an overview of our outcomes evaluation system, tools, and the most recent national data and trends. 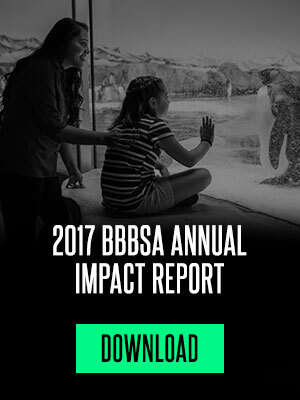 To view the 2017 BBBSA Annual Impact Report, click here. Research shows that our one-to-one mentoring programs have real outcomes for children.